The world was shocked when Ford said its next F-150 would be constructed of aluminum. Skepticism took hold when Ford said it would be tougher, more capable, and more rugged than any F-150 before it. 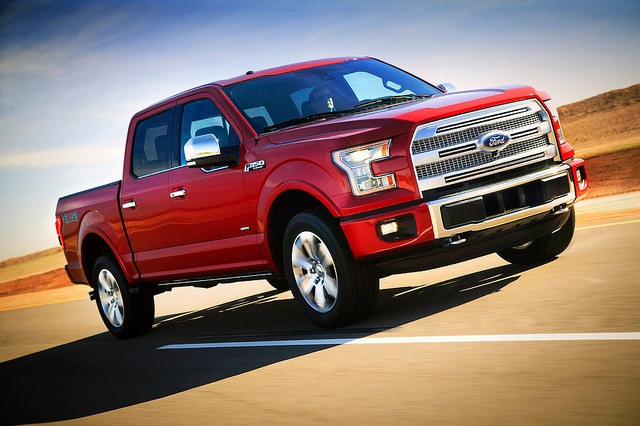 Jaws dropped when not one single 2015 Ford F-150 ad mentioned that it offers the best in-class fuel efficiency. Now, three months and four commercials into the 2015 F-150s ad campaign, and finally, Ford is touting the pickup’s impressive fuel economy. What was the holdup? The Ford F-150 is the nation’s best-selling vehicle, and changing its construction from steel to lightweight aluminum was a risk, to say the least. Truck enthusiasts want tough; they want rugged; they want dependable; they want capable. They don’t care so much about those EPA estimates. Ford heard their concerns, and—using their first three commercial spots for the 2015 F-150—they made sure we knew that this was one tough pickup. Now that we’ve heard the message loud and clear, Ford is ready to talk about that other benefit, saying in its latest commercial that the F-150 has “best in class EPA estimated gas fuel economy.” The 700 lbs the F-150 lost with its new aluminum construction not only allows it to tow more, but it also means it’s far more fuel efficient than its predecessor. Are you ready to test out the 2015 Ford F-150 for yourself? Stop by L&L Motors Ford today!